Power struggles within Google’s executive team, which have been brewing since the announcement of long time CEO Eric Schmidt’s departure, are apparently bubbling up to the surface. Case in point: In an extraordinary move to illustrate its independence, say sources, the Google webspam team actually classified Google Places as spam and a content farm, and temporarily removed it from search results. Rewind to February 24, when Google announced major revisions to its search algorithms to reduce the amount of “content farm” and other low quality content appearing in Google search results. Google specifically targeted “sites that copy others’ content and sites with low levels of original content.” See for example, a blog post by Matt Cutts, who leads Google’s webspam team, here. The changes were targeted at the huge content farms gaining notoriety on the Internet – Demand Media, Yahoo (via Associated Content), Huffington Post, etc. Google was just settling in to the changes when those sites fired back via even more complicated SEO ploys, say sources. And then Google made yet more changes to the way they classify spam and other low value sites. The Google webspam team has made extraordinary efforts to explain that they are completely independent of other parts of Google. The fact that most content farms generate the large majority of their revenue from Google Adsense ads placed around their content has been a problem for Google. Cutts has been unequivocal on Google’s policy: “Google absolutely takes action on sites that violate our quality guidelines regardless of whether they have ads powered by Google” he said back in January on the official Google blog. And now Cutts has earned the ire of another longtime Google exec, Marissa Mayer. Mayer controls Google Places, a service that gives information about local businesses and aggregates reviews from sites like Yelp and TripAdvisor, among other properties. Google Places, like many other Google properties, automatically show at the top of search results. The content aggregated by Places from third party sites is found, if at all, much lower in results. Google’s new algorithm changes automatically classified Google Places as spam, say sources inside Google, and for a few hours most Google Places results were inadvertently stripped from Google search results. The fact that many Place pages only contain content scraped from third party sites and little or no original content was a key factor in the automatic change, say sources. This has been a source of constant tension between Google and the sites they scrape. See, for example, the drama between Google and Yelp last year as Yelp content on Google Places was purged and then re-added. 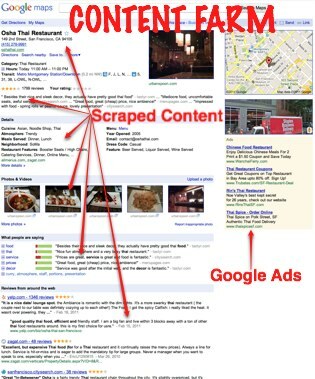 Place pages were quickly restored to Google search results over loud objections from Cutts and the webspam team. Cutts refused to comment specifically on this story, although he did say in an email exchange that Google absolutely does not use humans in determining search results and that the algorithms make ranking decisions based on a proprietary blend of a variety of signals, such as how much revenue Google generates from the results. “If Google were to determine that Google properties were not providing high quality results, it would not matter whether or not those Google properties were displaying Google ads,” he said. “It wouldn’t matter for what?” I replied, “I’m not sure you actually said anything.” He has not responded to that last inquiry. Update: Rosenblatt responds to yacht issue.